Indiana University professor Gerald Wright opened his class on congressional elections by asking students if they saw the previous night’s school-sponsored U.S. House candidate debate a few blocks from campus. Among almost 60 students, three hands went up. matters is what party the candidates belong to. No one needs to listen to a debate to figure that out. In any case, I’m willing to bet a million dollars — no, make it a billion — that young voters will turn out this year in roughly the same numbers that they always turn out for midterm elections. 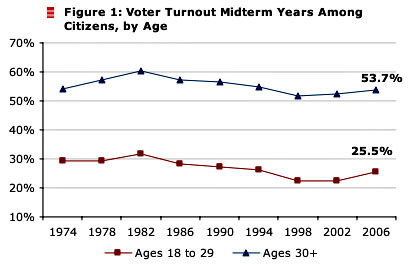 The chart on the right from the good folks at CIRCLE shows that youth turnout was up a bit from historical lows in 2006, but the broader trend is that turnout in general has gone steadily down, and a youth turnout rate of 20-22% this year would be entirely average. And that’s pretty much what I expect it to be. No thrill needs to be gone to explain this.